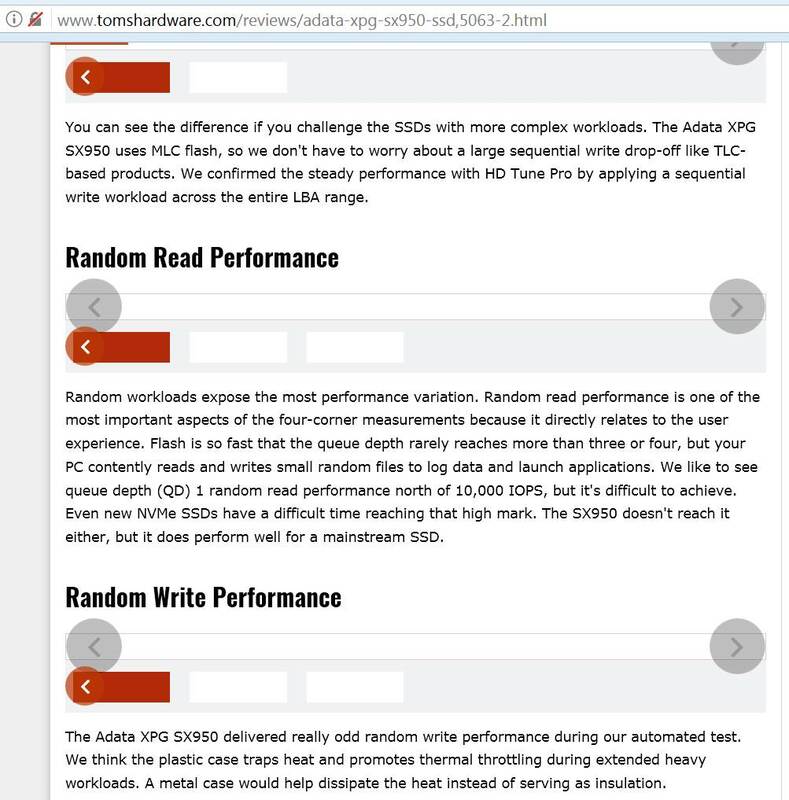 We've been disappointed with the new SATA SSDs over the last several years. Samsung has essentially ruled the SSD market and sets the tone by manipulating the price of the 850 EVO. Every other company plays catch-up and bases pricing on how their SSDs compare to the EVO. We hoped Micron's 3D NAND would turn the tide, but early SSDs with the technology fell flat. It took exactly one year to turn that around. Today, we test the drive Micron's MX300 was supposed to be. Adata's XPG product line is designed for gamers. The company doesn't differentiate it much from the other Adata products, like Kingston does with HyperX, but it is a unique series with added benefits. For example, the XPG SX950 uses a similar hardware configuration as the Adata Ultimate SU900. Both drives ship with the same SMI SM2258 controller, DRAM, and Micron 3D MLC NAND. Adata increases the SX950's warranty to six years, as opposed to five for the SU900, and includes a desktop adapter bracket. You may assume the XPG SX950 costs more because it includes extra components and a longer warranty, but it actually costs the same, or even slightly less in some capacities. There is more to this story than just a few extra accessories that many will ignore. Pseudo-SLC cache, which absorbs incoming write data, increases burst performance for TLC SSDs. Adata applied that technology to MLC flash but uses an improved firmware that makes it the fastest SMI-powered SATA SSD available. Adata achieved the feat with 3D MLC flash paired with SMI's Intelligent SLC Cache, which is a new and improved version of the write caching technology that SMI uses with TLC-based SSDs. Until this product, the SM2258-based SSDs would send all the data to the SLC cache and then fold it into the TLC or MLC later. That reduces NAND wear and increases endurance, but it also reduces performance consistency. The XPG SX950 takes the next step and adds algorithms that detect which workloads will benefit the most from caching and acts accordingly. It caches difficult workloads but directs data that won't benefit from caching directly to the MLC NAND. The XPG SX950 comes to market in three capacities that range from 240GB to 960GB. Adata chose the SMI SM2258 controller because it provides high endurance with low-density parity check (LDPC) technology. The controller has grown up since we've last tested it. The Intelligent SLC feature improves endurance but also increases performance. The XPG SX950 can read sequential data at 560 MB/s and write sequentially at 530 MB/s. The 240GB drive, the smallest of the lineup, turns it down a little to 520 MB/s. Random performance peaks at 90,000 IOPS for both reads and writes, though the smallest and largest drives do deviate slightly. We only found two of the three XPG SX950 SSDs available in the US and Europe. The 960GB drive is currently missing in action, but we suspect it will appear in a few months when the NAND shortage eases. The 240GB model retails for $129.99 at Newegg and the 480GB drive we're testing sells for $249.99. Adata backs the SSDs with a six-year warranty limited by the TBW (Terabytes Written) endurance rating. The 240GB drive can survive 200TB's of write data, and the company doubles endurance with each capacity increase. Adata brought back an old school accessory package that includes a 7mm to 9.5mm adapter and a desktop adapter bracket. The adapter allows your 2.5" SSD to fit in a 3.5" HDD bay. It's rare to see a desktop adapter these days, but several years ago they were standard with every new drive. Adata also gives you Acronis software to clone an existing drive's data to the new XPG SX950. The drive also works with the Adata SSD Toolbox software that provides a few management tools and monitors the SSD's status. The Adata XPG SX950 uses an all-plastic housing that doesn't help dissipate heat generated by the components. The case uses a standard 2.5" form factor with a 7mm Z-height. The three major components of an SSD are the controller, DRAM, and NAND. The SX950 uses an SMI SM2258H controller with LDPC and SLC cache technology. Micron manufactures the NAND, but Adata handles the binning and packaging. To date, Adata is the only third-party that we know of that bins and packages Micron's 3D flash. I tried using the contact form at the bottom of the Toms Hardware page, but it takes me to purch.com and the contact form doesn't work. It gets an internal error whenever I try to submit it. Also the pr@purch.com email address doesn't work either. Would you like to review the Seagate Nytro 141 256GB? I got it after learning about it from your article. It's still in the bubble wrap. One SSD that probably should have been included in the comparisons is the Samsung 850 Pro. That's the closest thing to the SX950 on the market. Both are expensive, 3D MLC drives that need a fairly demanding workload to show their stuff. This is why Tomshardware is becoming more and more useless each day. @Chalabam, are you sure your connection isn't the issue? The images work fine where I am. Maybe. For consumer workloads they definitely fail to dethrone the 850 Evo. Works fine here. Could have been a momentary hiccup on their host, or it could be a problem on your end. Either way, instead of "your site is useless because *I* am having an issue herp derp" maybe start with "hey the images in the article won't load for me, is anyone else having this problem?". Have to hand it to Samsung, they are still riding high in the segment with the 850 EVO that released in 2014...Pretty far ahead in the game. I can tell you that we have something just as fast but is cheaper. The review will be ready shortly. 480GB SATA III SSD for $250? Samsung 960 Pro 512GB M2 NVme SSD is just $279 now.